Which feedstocks should be purchased? When to schedule deliveries and material transfer operations? - On a monthly scale? - On a daily scale? How should the olefins product distribution be targeted across different time scales? Optience provides a rigorous optimization system implemented with the SCMart Suite Platform that has enabled Olefins and Aromatics facilities to answer these questions. Our methodology ensures that planners develop the optimum feedstock purchase and production plans resulting in significant financial benefits. An improvement in the order of 1-3% of feedstock cost reduction for ethylene plants can generate benefits in the order of tens of millions of US dollars annually. A rigorous mathematical programming approach is used to develop the optimal solution for the O&A planning and scheduling problem. First, a model of the supply chain is built with the SCMart Suite Modeler. 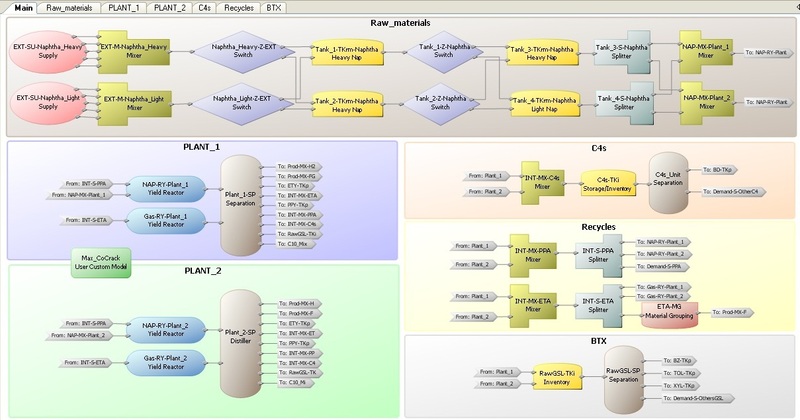 The modeling system uses a flowsheet based approach where the model can be graphically built according to the material flow and business process. The mathematical representation of this material flow is then generated automatically. This representation may be a linear, nonlinear and/or a combinatorial (mixed integer) optimization problem, depending on the complexity of the processing units in the supply chain. Depending on the nature of the mathematical model, pre-tailored solution strategies are automatically employed in order to find the optimal solution. The total feedstock to be purchased with break down of quantity and quality of each feedstock along with their shadow prices in each time period. The allocation of feedstock type and quantity to each furnace in each time period. The inventory, flow of materials, and conditions in the processing units at each time period across the multi-site supply chain. All estimated final products for sale and transfer products in each time period. The data needed to generate the optimal plan can be input manually, or directly transferred from your corporate database or Microsoft Excel file into the SCMart Planning application. A rundown of typical input variables is provided below. Market demands and the available feedstock basket can be input as fixed values or as minimum and maximum values with priority definitions. The SCMart planning solution typically satisfies the demands that will provide the greatest economical profit, while considering the defined priorities. Plant Constraints such as limits on process variables such as flows, conversions, coil outlet temperatures may be entered into the planning model. Discrete constraints such as furnace availabilities, vessel loading/unloading durations, flow switches, tank transfer constraints can be also be entered. Inventories at the start of the plan period should be entered. These include feeds, intermediates, and final products. The storage policy such as minimum and maximum inventories may also be entered for each time period. Prices and Costs need to be entered and will be used to select the feedstock and decide on final products that maximize the profit, while satisfying all constraints. We support a wide variety of pricing and cost patterns. The Scheduling application considers a finer time scale, and optimizes daily operations such as tank and vessel transfer operations, feedstock lineup to the furnaces to ensure that daily production constraints are met while ensuring optimum use of materials. The results obtained in the planning module are automatically transferred to the scheduler module, which attempts to maintain the optimal targets and objective set from the planning step. In case this objective cannot be achieved, the scheduling module indicates the reason and may provide guidance to revise the plan. The information needed for the scheduling application is similar to that for the planning application, except that inventory and plant constraints need to be provided on a finer time scale, typically on a daily basis. The scheduler can also be configured to run policies such as maximum segregation between light and heavy Naphtha. In these cases, it considers the quantity and composition of each tank in the feedstock tank farm and the possible flow arrangement between them to optimize the naphtha and condensate blends to preserve segregation over the schedule horizon. The planning and scheduling solutions are both built with the same SCMart Suite platform providing a consistent user experience across the workflow. Both applications present a gamut of customizable reports, which include the total financial picture as well as specific information such as costs important to each user ranging from sales, logistics, feedstock purchases, and utility costs. In addition, the solution will be able to point out the variables that are at constraints and the opportunity cost of relaxing these constraints. A critical step in developing accurate plans is the development of reliable yield models. The optimal feedstock blend to a furnace can be determined only if the cracker yields are well correlated to feed properties. The SCMart Estimator product is utilized to develop nonlinear correlation models for the planning and scheduling applications. For olefins complexes, the most important correlation is the cracker yield model with respect to feed properties, rates and operating conditions. Some implementations include correlations for reformers and gasoline blending operations when they are part of the olefins complex. The module can use various data sources, from the results of rigorous simulators to laboratory measurements to estimate the parameters. Parameters in the yield model can be updated easily from new data, and the resulting parameters can be shared seamlessly with the planning and scheduling model. The Trader defines the possible universe of feedstock purchases based on contracts or spot market purchases. Each feedstock has an associated price and properties. This information is combined with the information provided by the planning department on forecasted demands and plant capacities to develop an optimal feedstock purchase basket and associated shadow prices. The trader then attempts to secure this feedstock basket. The Planner takes the purchase basket information from the trader, and runs detailed cases to determine the optimal line up of feeds to each facility and cracking furnace, the blending patterns, and plant operation conditions for specified time horizon, typically ranging from three months to a year. The Scheduler takes the objectives defined by the Planner to generate a feasible and detailed scheduling solution for each day, with the minimum deviation from the planning objectives of maximized profit. The application provides feedback when the planned targets cannot be achieved at the scheduling step. For additional information on our O&A solutions, please email us.